Canberra United coach Heather Garriock would still be playing if the Matildas current maternity policy was in place five years ago. Garriock's Australian career came to an end when former national coach Hesterine de Reus failed to accommodate the 130-game veteran after the birth of her first child. Reus was later sacked following a sensational player revolt but the damage had been done and Garriock never played for the Matildas again. Fast forward five years and on the eve of her first W-League season as a coach, Garriock is pregnant again, but this time the response from her employer could not have been any different. 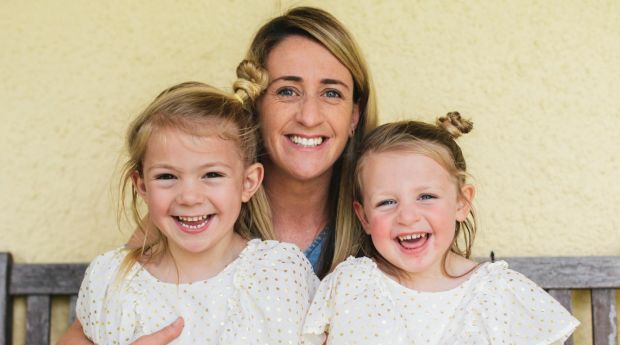 The 34-year-old doubles as the Matildas assistant coach and admits she was nervous telling her bosses last week that she was three months pregnant with her third child. "I shouldn't have been nervous because the way they reacted was exactly the way you would expect in this day and age," Garriock said. "There was genuine happiness from Phil [Capital Football boss Phil Brown] and Staj [Matildas coach Alen Stajcic] and they threw their support behind me. "Most females have to go through the anxiety of telling their bosses but I'm so grateful to be at Canberra United because it wouldn't be that smooth in other places. "I'm going to have to forego my role with the Matildas because we've got Asian Cup qualifiers in April and that's when the baby is due. "So there are sacrifices but it's a choice that me and my family have made and it's an important choice because family is always first." Heather Garriock at home with her daughters, Noa, 3, and Kaizen, 5. Photo: Rohan Thomson Garriock concedes the way her playing career ended left a bitter taste in her mouth and has vowed as a coach to support any player in the same situation. "Hesterine found it very difficult to understand that being a mother and professional footballer could align, it wasn't something she could grasp and made it really difficult to do both," Garriock said. "My last tour with the Matildas was to America where I took my 10-month-old daughter and there were so many rules and regulations. "The treatment and non-support was something that nobody should have to endure, especially someone representing their country while trying give their best as a mother. "I was 29 at the time and at the peak of my career, I definitely didn't fulfil my potential and I do wish I still was playing. "But in the end it was my choice to turn to coaching because I felt that was the career that would be closest to the feeling of being an international player." W-League players secured a landmark wage deal this season which included a new maternity policy, with airfares and hotels funded for players travelling with children three and under. Garriock arrived in the capital from Sydney University where she coached until she was 38 weeks pregnant and if United make the grand final will be on the sideline at 34 weeks. "I'm a professional in what I do and the only difference will is my stomach is going to be bigger," Garriock said. "When you have the baby you are focused on the baby, but most ambitious women still want to have that outlet and mental stimulation of juggling the two. "As a player, football was my life and my number one priority but then I gave birth and realised there's more to life than just football. "I'm still very passionate about it but I think I can now have the best of both worlds." Garriock said support for women has "come along massively" since her playing days but wants to see the same backing for coaches. "Being a pioneer in the sporting world is something that I did as a player with getting contracts introduced and to do that from a coaching sense would be amazing," Garriock said. "Because I wouldn't be able to do what I do without the support of my husband, especially with the lack of remuneration in women's coaching, I always joke that he supports my hobby. "Let's hope coaching gets to where playing is at and I can be a pioneer for females who want to be ambitious in sport and a mother and not be scared they have to forego one or the other." This story Heather Garriock will coach Canberra United 34 weeks pregnant first appeared on The Sydney Morning Herald.